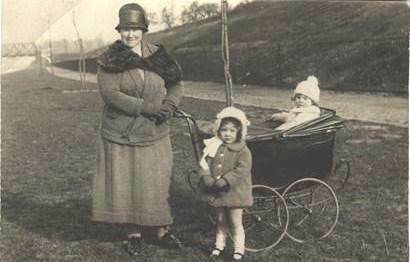 This is a photo of my grandmother, Emily Alice Beardsworth, on the Great West Road in 1924. Please use if it is of any interest. Emily Alice reminisced about her time as a lamplighter in Brentford at some time between 1910 - 1917. Do you have any information about lamplighters in Brentford? I have already noted the reference to lamplighting in the Dear family of Brentford on the website. I would be interested to know who employed them, the routes allocated, rates of pay, etc. Julie's email reminded me of a photo on the site showing a slim lady up a ladder attending to a gaslamp: Emily Rebecca Goddard (nee Carr). She worked for the Brentford Gaslight & Coke Company, and was employed to clean and trim the gas street lamps. A look at the British Newspaper Archive on Findmypast shows some councils employed lamplighters but a reference to a Brentford lamplighter shows he was employed by the Brentford Gaslight & Coke Company; it seems likely Emily Alice was too. Edmund King's blog has a compilation of newspaper items about lamplighters and at the end are some useful links. Emily Beardsworth became stout after the birth of her two babies, so it is possible that she, like Emily Carr, was capable of climbing ladders in the years of WW1 - I do have photos of her wedding, and photos of her in the years preceding it, so can verify she was slim during her teenage years! Also see Julie's A Wartime Romance, the story of a wartime romance between a Brentford girl, Joan Beardsworth, and her Welsh fiance Ray Llewellyn, who married in 1944.